Only years later, when Allen discovered the same profile in macrophages at the site of surgical wounds,3 did the pieces fall into place—the immune cells appeared to be producing proteins involved in tissue repair, a brand-new function for macrophages. For more than a century, macrophages—which means “big eaters” in Greek—were considered relatively simple cells whose sole job was to engulf bacteria, other microbes, and cellular debris. 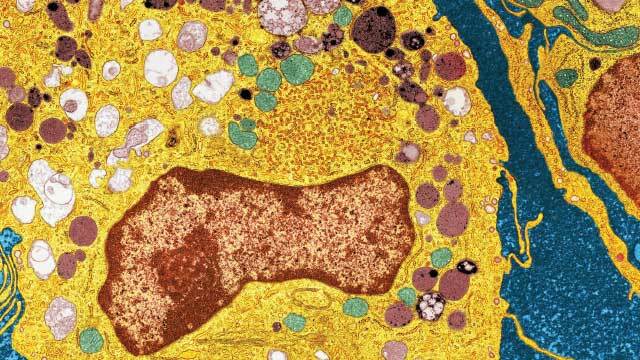 Averaging around 20 μm across in humans, they are among the largest cells in the body, which helps them to physically surround and digest their microscopic meals. “You can think of them as the vacuum cleaners of the body,” Babak Razani, a physician and researcher at Washington University School of Medicine in St. Louis, writes in an email. But over the last 10 years, research has demonstrated that this is only part of the picture. In terms of immune defense, investigators now understand that macrophages mount a three-stage response to infection. “Their initial role when our body is invaded with a pathogen is a more inflammatory-and-defense function,” says Sourav Ghosh, a biologist at Yale University School of Medicine. Macrophages stimulate inflammation and release a cocktail of molecules to kill microbes. After engulfing a pathogen, macrophages keep hold of pieces of the invader’s proteins, known as antigens, and present these to T cells. As researchers have begun to take a closer look at these underestimated cells, they have also recognized roles for macrophages outside of immunity. For example, the cells are involved in directing tissue development, transporting chemical messages, even regulating body weight and conducting electrical impulses. 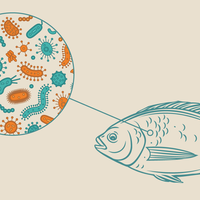 “With the advent of single-cell genomics, we’re in a moment when we can actually look at individual subtypes of macrophages, and we’re finding that there is an enormous heterogeneity amongst them,” explains Rosenthal. 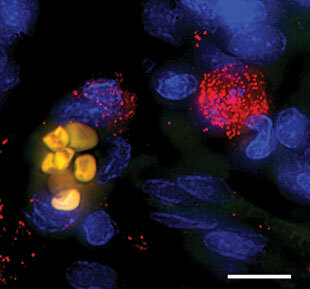 MACROPHAGES AROUND THE BODY: Tissue-resident macrophages, which not only respond to local assaults but also function in normal development and physiology, originate in the yolk sac of the embryo and mature in one particular tissue in the developing fetus, where they acquire tissue-specific roles and change their gene expression profile. By contrast, circulating macrophages are produced throughout life by the bone marrow, then released into the vasculature to respond to infections and injury. Tissue repair doesn’t always go smoothly, however. 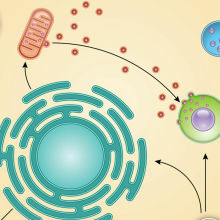 In chronic injuries, conflicting signals can confuse macrophages into activating all three stages of their response at once. “You can have macrophages that are at the proinflammatory stage of activation, macrophages that are pro-wound healing, and macrophages that exhibit some pro-resolving activities, all at the same time,” leading to wounds that simply won’t heal, explains Wynn. Other times, wounds do heal, but the injuries leave a scar. Internal scarring, also known as fibrosis, is a hardening of tissues that occurs when macrophages stimulate fibroblasts, which synthesize the extracellular matrix, to produce too much collagen during the repair process. Scar tissue is at the root of many diseases, including liver cirrhosis, and cardiovascular and kidney diseases. “Fibrosis is one of the biggest challenges in Western medicine—that’s what most people end up dying of,” says Allen. 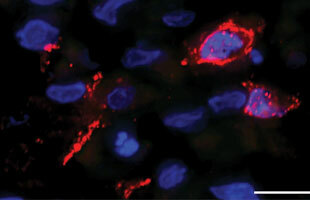 Macrophages (red) at the wound site in spiny mouse ear tissue five days after injury. (Scale bar = 10 micrometers)JENNIFER SIMKIN Perhaps nowhere in the body is the ability to repair damaged tissue more important than in the heart. Although fetal mammals are typically able to regenerate heart tissue without scarring, most species lose that ability as adults, for reasons scientists still don’t fully understand. Studying heart repair in mouse fetuses, researchers have learned that, while macrophages are often responsible for the development of fibrosis in adults, they also play a starring role in scar-free repair. Kory Lavine, a researcher and cardiologist at Washington University School of Medicine, suggests that the difference may be attributed to where the macrophages come from. Macrophages (red) emerge from a blood vessel (red blood cells stained in yellow) at the wound site five days after injury in spiny mouse ear tissue. (Scale bar = 10 micrometers)JENNIFER SIMKINIn addition to the well-studied circulating macrophages (often called monocytes) that are produced in the bone marrow and are released into the blood to patrol for and respond to infection, in the 1980s researchers began to recognize that some macrophages are produced from embryonic stem cells during early development and remain permanently within one tissue. “The biggest revolution in macrophage biology in the past five years has been this understanding that macrophages that live in the tissues are quite fundamentally different than macrophages that circulate in the blood,” explains Allen. Just as macrophages seem essen­tial for setting up a blood supply for devel­oping organs, they are also complicit in helping tumors develop. 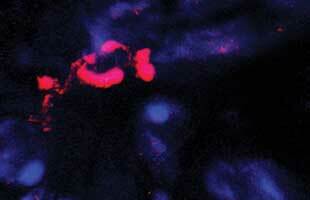 A macrophage (red) participating in Wallerian degeneration of peripheral nerve in a regenerating axolotl limb. Cut nerve fiber labeled in blue.IMAGE BY JAMES GODWINMammals’ ability to repair tissue is impressive, but some animals are able to regenerate entire appendages. Cellular regeneration is the ultimate form of tissue repair, and recent research suggests that the response of macrophages and other immune cells immediately after injury may play a critical role. In 2013, for example, Nadia Rosenthal of the Jackson Laboratory and colleagues reported that macrophages were essential for successful limb regeneration in the axolotl (Ambystoma mexicanum).10 “The first five days of wound healing [in most organisms] involves a stately procession of different components of the immune system, which arrive like clockwork at the site of the injury,” Rosenthal says. But not so in a regenerating axolotl limb. “Within 24 hours, every cell type that we can identify in the salamander’s immune system is on board at that site,” suggesting a very rapid progression of normal wound healing factors and the speedy resolution of the inflammatory phase, she says. During tissue repair and regeneration, “we think the different immune cell types help facilitate activation of local fibroblasts,” Seifert explains. Fibroblasts, under the direction of macrophage-produced signals, can form extracellular structures that act as scaffolding during the repair process. 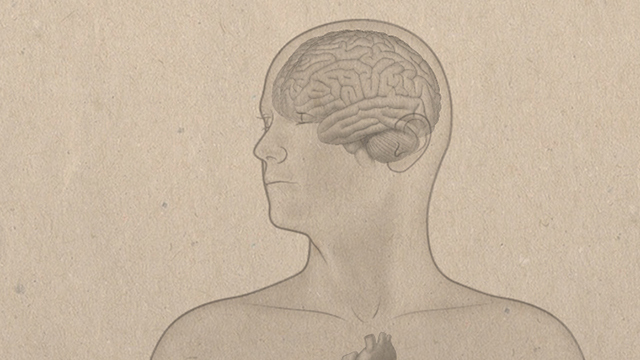 A similar process also guides neurons and blood vessels in the developing brain. Resident macrophages in the brain, known as microglia, populate the organ during embryonic development, producing growth factors for neurons and coordinating synaptic pruning—both essential processes for normal brain development. “[Microglia] set up a completely independent population of self-renewing cells,” separated from macrophages in the rest of the body by the blood-brain barrier, says Chris Glass, a molecular immunologist at the University of California, San Diego School of Medicine. Further evidence for macrophages’ role in the development of the brain and its vasculature came earlier this year, when neurobiologist Ana Martin-Villalba at the German Cancer Research Center (DKFZ) and colleagues found that a macrophage-produced protein called CD95L binds to CD95 receptors on the surface of neurons and developing blood vessels in the brains of mouse embryos. The CD95 receptor and its ligand are best known for triggering cell death, or apoptosis, in response to viral infections, cancers, and stressors, such as free radicals and oxygen deprivation. Without CD95L, Martin-Villalba’s team showed, neurons branched less frequently, and the resulting adult brain showed less electrical activity.14 “In the developing brain the macrophages, just using one signal, are shaping the developing neurons and vessels at the same time,” she says. Developing tumors attract circulating monocytes from the blood and stimulate the immune cells to become tumor-associated macrophages. When the process goes smoothly, these macrophages kill tumor cells and release factors to destroy their blood supply. But when things go wrong, they instead produce growth factors that help the developing tumor grow its network of blood vessels, just as macrophages do for developing organs in a fetus. The link between macrophages and cancer was first identified in the 1860s, when German physician Rudolf Virchow noted that cancer was often associated with inflammation. But it wasn’t until the 20th century that his ideas were taken seriously, as researchers began to find loads of the cells in biopsied tumors. Researchers now know that some 15 percent of cancers are triggered by infection, which can jump-start the inflammatory process. Macrophages are also found at the site of cancers caused by other factors, such as carcinogens or genetic mutations, and cancer initiation and progression has been linked to chronic inflammation.15 “The most aggressive types of cancer have the highest infiltration of macrophages and other immune cells,” says Martin-Villalba. Researchers have long known that CD95L, also known as the death protein for its role in apoptosis, is expressed by certain immune cells to trigger the process in cancer cells. But tumors can become resistant to CD95L’s apoptotic effects. In addition to preventing cancer cell death, this resistance might also help tumors survive and develop by promoting blood-vessel growth, Martin-Villalba suggests. “We postulate that macrophages in a brain tumor can produce signals like CD95L that act on vascularization of the tumor,” she says. During Phase 2 clinical trials in 2012, she and her colleagues found increased overall survival in one group of CD95L-expressing brain tumor patients when treated with a protein compound that binds CD95L to prevent it from activating CD95 receptors. 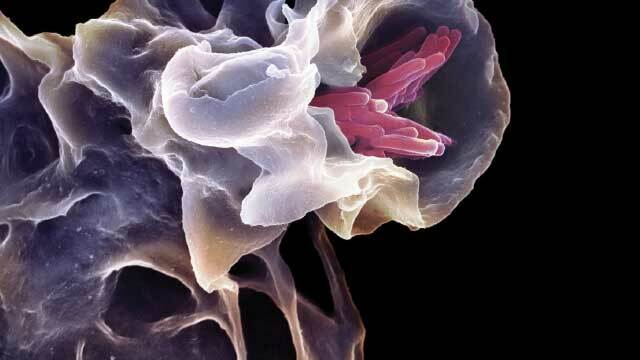 It is now eminently clear that macrophages are far more than the garbage disposals scientists first viewed them as. Macrophages may also be involved in a host of neurodegenerative diseases and psychiatric illnesses. Earlier this year, Glass and colleagues analyzed the transcriptomes of microglia from 19 patients undergoing brain surgery, and found that many genes containing risk variants previously associated with diseases such as Alzheimer’s, Parkinson’s, schizophrenia, and multiple sclerosis were more highly expressed in microglia than in other cells in the brain.16 For instance, 58 percent of genes known to influence the risk of developing Alzheimer’s disease were expressed at levels at least 10 times greater in the microglia than in cortical tissue. This suggests that these genetic variants may increase the risk of disease for patients carrying them by affecting the action of microglia in the brain. Within hours of being removed from the brain and cultured in the laboratory, however, the microglia had completely changed their expression profile, reducing transcript levels of more than 2,000 genes. Their ability to rapidly change according to environmental conditions might have important implications for scientists studying microglia, making it difficult to generalize from cell-culture studies to macrophages in vivo. Beyond their roles in development and wound healing, macrophages are now recognized for their important functions in maintaining the status quo in the adult body. Tissue macrophages are highly sensitive to changing conditions, and respond by releasing cell signaling molecules that trigger a cascade of changes allowing cells to adapt. For instance, macrophages in adipose tissue regulate the production of new fat cells in response to changes in diet or exposure to cold temperatures. Macrophages in the liver, known as Kupffer cells, regulate the breakdown of glucose and lipids in response to dietary changes, and have been linked to obesity and diabetes. “Nowadays they are recognized as major sentinel cells that can sense changes in tissues,” says Rothlin. Indeed, when they measured the membrane electrical potential of macrophages and cardiomyocytes, the researchers found the cells are directly involved in conducting electricity, polarizing and depolarizing rhythmically to help keep the heart beating regularly. “That was the other big surprise for me,” Nahrendorf says—“that there’s really electrical connection and cross talk between macrophages and cardiomyocytes.” Rosenthal was similarly taken aback. The role of macrophages in electrical conduction “was a complete shock,” she says. Given macrophages’ ever-expanding role in normal development and physiology as well as disease, perhaps it should be no surprise that researchers are now eyeing the cells as potential targets for various therapies. One potential application may be in treating atherosclerosis, plaque build-up in the arteries that can result from inflammatory macrophages engulfing excess lipids. The cells eventually become lipid-engorged, and these “obese macrophages,” as Babak Razani of Washington University School of Medicine calls them, tend to stimulate more inflammation and recruit more macrophages, clogging the circulatory system and heart with plaque. But Razani believes he may have found a clever trick to improve macrophages’ ability to play a more positive role. 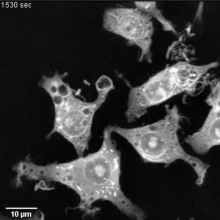 This June, Razani and his colleagues showed that macrophages in the blood vessels can be stimulated with a common sugar molecule to become “super macrophages,” with an enhanced ability to degrade plaque.20 Trehalose, a disaccharide, changes macrophage gene expression, causing the cells to carry more digestive organelles called lysosomes, and resulting in a 30 percent decrease in atherosclerotic plaque in mice injected with trehalose. “Trehalose is a safe and natural sugar, already being used in many pharmaceuticals and being consumed as a sweetener,” Razani says. But he warns a healthy heart is not as simple as just adding more sweeteners to your tea. When consumed in the diet, the enzyme trehalase quickly breaks down trehalose into the simple, nontherapeutic sugar, glucose. The next step towards a medicinal application of this research will be to find ways to deactivate trehalase, so that trehalose can make it into the bloodstream undigested, ready to unleash its macrophage-enhancing powers. Claire Asher is a freelance science writer living in London, U.K.
P. Loke et al., “Alternatively activated macrophages induced by nematode infection inhibit proliferation via cell-to-cell contact,” Eur J Immunol, 30, 2669-78, 2000. P. Loke et al., “IL-4 dependent alternatively-activated macrophages have a distinctive in vivo gene expression phenotype,” BMC Immunol, 3:7, 2002. P. Loke et al., “Alternative activation is an innate response to injury that requires CD4+ T cells to be sustained during chronic infection,” J Immunol, 179, 3926-36, 2007. T.A. Wynn, K.M. Vannella, “Macrophages in tissue repair, regeneration, and fibrosis,” Immunity, 44:450-62, 2016. S. Ghosh et al., “Macrophage function in tissue repair and remodeling requires IL-4 or IL-13 with apoptotic cells,” Science, 356:1072-76, 2017. C.M. Minutti et al., “Local amplifiers of IL-4R–mediated macrophage activation promote repair in lung and liver,” Science, 356:1076-80, 2017. S. Epelman et al., “Embryonic and adult-derived resident cardiac macrophages are maintained through distinct mechanisms at steady state and during inflammation,” Immunity, 40:91-104, 2014. A.B. 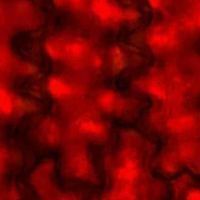 Aurora et al., “Macrophages are required for neonatal heart regeneration,” J Clin Invest, 124:1382-92, 2014. K.J. Lavine et al., “Distinct macrophage lineages contribute to disparate patterns of cardiac recovery and remodeling in the neonatal and adult heart,” PNAS, 111:16029-34, 2014. J.W. Godwin et al., “Macrophages are required for adult salamander limb regeneration,” PNAS, 110:9415-20, 2013. T.R. Gawriluk et al., “Comparative analysis of ear-hole closure identifies epimorphic regeneration as a discrete trait in mammals,” Nat Commun, 7:11164, 2016. J. Simkin et al., “Macrophages are necessary for epimorphic regeneration in African spiny mice,” eLife, 6:e24623, 2017. J. Leid et al., “Primitive embryonic macrophages are required for coronary development and maturation,” Circ Res, 118:1498-511, 2016. 1S. Chen et al., “CNS macrophages control neurovascular development via CD95L,” Cell Rep, 19:1378-93, 2017. A. Mantovani et al., “Cancer-related inflammation,” Nature, 454:436-44, 2008. D. Gosselin et al., “An environment-dependent transcriptional network specifies human microglia identity,” Science, 356:eaal3222, 2017. 1T.A. Wynn et al., “Macrophage biology in development, homeostasis and disease,” Nature, 496:445-55, 2013. N. Mossadegh-Keller et al., “Developmental origin and maintenance of distinct testicular macrophage populations,” J Exp Med, 214:10.1084/jem.20170829, 2017. M. Hulsmans et al., “Macrophages facilitate electrical conduction in the heart,” Cell, 169:510-22.e20, 2017. I. Sergin et al., “Exploiting macrophage autophagy-lysosomal biogenesis as a therapy for atherosclerosis,” Nat Commun, 8:15750, 2017.